Mostly I am writing over the break. But in the evenings I read. 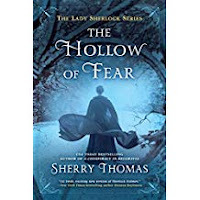 Sherry Thomas, The Hollow of Fear. This is the third book in the Lady Sherlock series, which I am liking quite a bit. Sherry Thomas is apparently better known for her romance novels, so maybe I will try those next. In any case, in the Lady Sherlock series, Thomas has gender-flipped Sherlock Holmes, and in an interesting way -- Charlotte Holmes, unable to find a way to make a living as a (fallen) Victorian woman, creates a fictional persona, her brother Sherlock, a recluse. She acts as his Archie Goodwin, more or less. The mysteries in these are fine, and there's an over-arching mystery that will apparently encompass most of the books; but the real treat here is Thomas's writing and the interplay of the main characters. If you've heard of Canfield Fisher at all, it's because of Understood Betsy, a kid's book that was popular back in the early-to-mid years of the 20th century. If you haven't read Understood Betsy, and you like children's fiction, I highly recommend it. Canfield Fisher also wrote books for adults, however, and I've been reading those that are available for free online (attempting to keep my book expenditures down). This one is the story of a family and specifically of one of their children, Sylvia. The family is a big part of the story -- the father, who comes from the East Coast upper class, married a farmer's daughter, and they moved to the Midwest (This is all set sometime in the 19th century) where he works as a professor at the local state college and she runs their tiny farm. Class issues are a big part of the story, as are racial issues and sexism. Like Middlemarch, this is the story of a specific place at a specific time, and the small group of people who live there. I enjoyed it very much. It's available free through Gutenberg. More Archie Goodwin and Nero Wolfe books. If you like mysteries set in the 1930s and 1950s (Stout mostly didn't write during WWII, because he was doing war work), you'll like these. They're very relaxing, which is probably why I'm reading so many of them over this break. I also watched the new Watership Down on Netflix, as well as Bird Box and the third season of Travellers. These are all watchable, though the new Watership Down isn't nearly as good as the book, or the 1970s movie. Read the book, that's my advice.